This entry was posted in Food, Nepali Culture, Nepali Holidays and Festivals and tagged Dashain, Goats, Google, Nepali Festivals, Slaughter, Vegetarianism by nepali jiwan. Bookmark the permalink. It is so easy to forget the fact where meat comes from once it is cooked and ready to eat in the plate. I remember one year when I was small, our family bought goat for Dashain. We had the cute goat for 3 days before it was slaughtered. I fed him and looked after him so I couldn’t eat his meat. I turned vegetarian for next 3 years until I was forced to eat meat again. Now I enjoy meat but won’t watch animal being killed. Hope you are enjoying Dashain!!! I miss going shopping for goat with my dad. The goat would get to live with us for a night or two. I used to watch them graze in the front lawn of my house and at night we would tie him up in the house. Sometimes it would be really difficult to sleep at night. Then we would take them to a slaughterhouse the next day. The same afternoon, my mom (she’s a vegetarian) would be cooking various delicacies of goat meat. It’s been many years I haven’t had goad meat actually. The last time I had was back about two years ago and I plan to give up goat meat eventually. However I do not think I can give up meat and fish easily. Is this your first Dasain in Nepal? 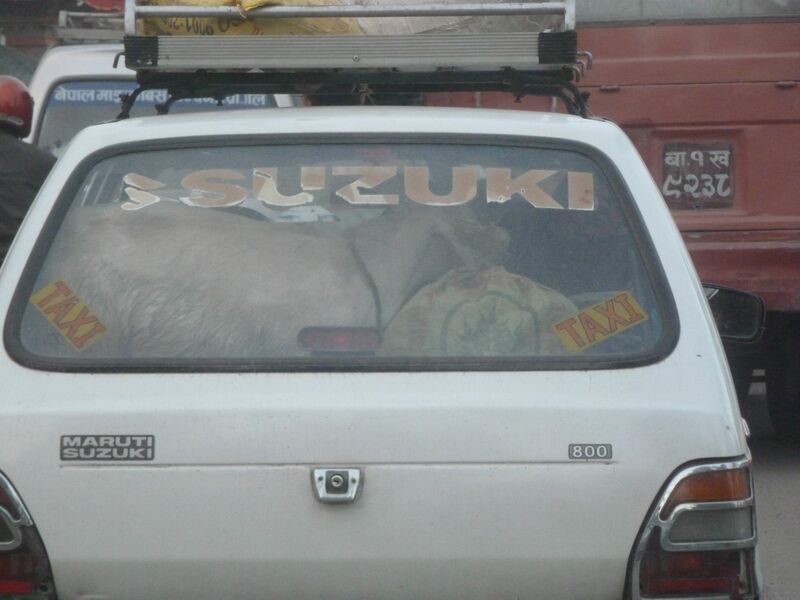 I remember seeing two goats in a taxi in Pokhara (sounds like that start of a joke, doesn’t it?) and I had no illusion about where they would end up. I can’t watch at all but I respect where my food comes from. I at least thank the animal for it’s sacrifice. But goat is so delicious, it is a split call.